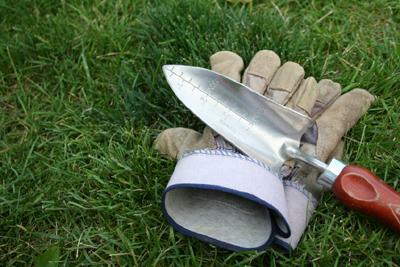 A good pair of gardening gloves goes a long way in making gardening tasks pleasant and keeping your hands safe. There are different types that work best in different situations, so it's best to think about when you'll need gloves and have several types ready for the tasks you do most often. Gardeners' hand can be injured by thorny plants, irritating sap, sharp edges of ornamental grass, blisters, sunburn and splinters. Soil wicks moisture from your skin, so gloves also help protect against dry skin. They provide comfort as well as safety, keeping hands warm and dry in cold and wet weather during spring and fall- the times the majority of garden tasks need attention. Wearing them saves time too, by keeping your hands and finger nails cleaner. When purchasing try them on and wiggle your fingers to make sure they won't impede circulation as you work. Make sure they are flexible and the inside isn't rough feeling. If your hands get hot easily, choose ones made of breathable material. Check the cuff to see that it provides adequate coverage for your wrists. Gardening gloves are generally sized as men's, women's and children's, with small, medium and large sizes of each. Heavy cotton is the choice for traditional all-purpose work gloves. They sometimes have rubber dots on the palms for a better grip, and they now come in all sorts of fun colors and patterns. One step up from the cotton glove are cotton knit with latex coating over the whole hand or just the palm and fingers, leaving the back of the hand plain cotton for ventilation. These are great for damp days or dirty tasks. Mud Gloves is a brand that comes in many colors. Rubber with gauntlets are excellent for really muddy work and pond tasks. Thin rubber or latex are good for detailed tasks. For planting seeds or transplanting seedlings in cold weather, look for fingerless gloves. Heavy-duty leather are good for sawing, heavy pruning, moving brush. Some have a long cuff for added wrist and arm protection. Vegan versions, made with non-leather material, are available from specialty suppliers. Cold weather, made of leather or rubber have a fleece lining. Use Neoprene when working with chemicals or poisonous plants. To make a pair of short cuffed, sturdy gloves more versatile, get a pair of heavy nylon sleeves that fit over your hands and shirt for more arm protection. Cotton can be rinsed under the hose and cleaned in the washing machine with warm water and tumbled dry. Knit and latex can also be machine laundered, but use cool water and hang up to dry. Rubber gloves should be cleaned at the hose or utility sink, an easy job if you just wash them while wearing them. To prevent leather from cracking, rub with leather wax on a soft cloth. Some split leather (suede) gloves can be machine-washed. Store in a dry place to prevent mildew. Hanging clips inside the door of your potting shed or garage keeps gloves dry and easy to find when you need them.